Definition: Shingles, also known as herpes zoster, is a viral disease characterized by a painful, blistering skin rash that affects one side of the body, typically the face or torso. It is caused by the varicella-zoster virus, the same virus that causes chickenpox. Anyone who has recovered from chickenpox can develop shingles. After people had chickenpox, the virus lies inactive in nerve tissue near their spinal cord and brain. Years later, the virus may reactivate as shingles. Shingles are most common in people over the age of 50 years. Once exposed, the virus can lay dormant for years. Most adults with the dormant virus never experience an outbreak of shingles or any further problems. However, in some individuals, it may reactivate multiple times. 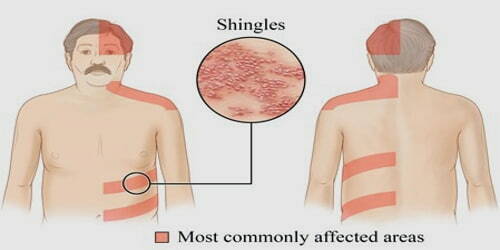 Shingles is a painful infection of the nerve supplying an area of skin and are accompanied by a localized skin rash. Diagnosis is typically based on a person’s signs and symptoms. The shingles vaccine reduces the risk of shingles by 50 to 90%, depending on the vaccine used. It also decreases rates of postherpetic neuralgia, and if shingles occur, its severity. It is estimated that about a third of people develop shingles at some point in their life. While more common among older people, children may also get the disease. The disease has been recognized since ancient times. Causes, Sign, and Symptom: Shingles is caused by the varicella-zoster virus — the same virus that causes chickenpox. The varicella-zoster virus belongs to the Herpesviridae family. Only those who have previously had chickenpox can develop shingles later in life, and rarely, those who have received the varicella vaccine can develop shingles later in life. After recovering from chickenpox, the virus remains in the body. It lies dormant in the central nervous system (CNS). The varicella-zoster virus belongs to a group of viruses called herpes viruses. This is why shingles is also known as herpes zoster. 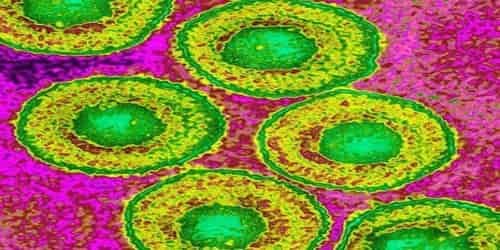 But the virus that causes chickenpox and shingles is not the same virus responsible for cold sores or genital herpes, a sexually transmitted infection. In most cases, it is not clear why the varicella-zoster virus begins multiplying to cause shingles. One suggestion is that shingles occur when something weakens the immune system, prompting the virus to reactivate. Shingles in children are often painless, but people are more likely to get shingles as they age, and the disease tends to be more severe. The shingles rash should fade after 2 to 4 weeks. But the skin underneath the rash might change color and always stay that way. The pain can last for months or years. Complications: Shingles cannot be passed from one individual to another. Postherpetic neuralgia. For some people, shingles pain continues long after the blisters have cleared. 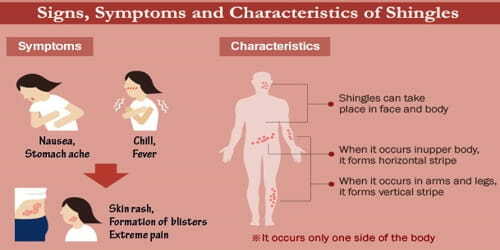 Shingles are not spread through coughing or sneezing but through direct contact with fluid from the blisters. Before the blisters develop and after the crusts form, the person is not contagious. Shingles are less contagious than chickenpox. The risk of spreading the virus is low if the rash is covered.